Wepler in the 18th: Under new and not altogether management. 6.5 Wepler, 14 place de Clichy in the 18th, 01.45.22.53.24,open 7/7, has been under the "new" management of the Groupe Joulie, which runs Sebillon, Chartier, etc., for over a year and I finally had a craving for oysters and nearby. It and its menu look pretty much the same but "management," ah, that's another matter. Colette started with a traditional brasserie fish soup which had some texture and good taste and our art historian friend who lives nearby and I enjoyed oysters and bulots (unpictured). Colette finished with their traditional floating island which we all agreed was very good. Our bill, well, ahem. Just as I called for it, an older gent at a neighboring table got his bill and called the manager over to dispute it. Oh, oh. So I inspected ours extra-carefully. Wait!, we ordered portions of 6 and 9 oysters, but were billed for another 6. There ensued a heated discussion between our native francophonic friend and the waitguy, ending with his stomping off and producing a new bill, which with a bottle of wine and two coffees, was 106.50 or 71 E a couple. dB's were 75.3 until the dispute. Go back? I figure I've been 3 times in 30 years; that's about right. Vava in the 18th today had room for 4 of us who had intended to go elsewhere but thank whoever invented mobile phones, we quickly shifted and did very well, indeed. Our friends started off having the gravlax with grapefruit and burrata and stuff. Then two of us had the fish of the day - lieu jaune and two the meat of the day - a selle d’agneau. Very nice all. For dessert we shared the apple chausson and kiwi fruit and ice cream. Our bill with the equivalent of a bit under two bottles of wine and 4 coffees “offered,” was 140€ or 70€ a couple. Bistrot du Maquis in the 18th: Why can't we have this level and variety of cooking in America? Le Bistrot du Maquis in the 18th is on so many borders of Montmartre: between that of the tourists and plain folks, between the upper and lower hill, and between schlock and sheen. Entering the world of Qin and André Le Letty, ex of the Tour d'Argent, is to enter what Sebastien Demorand coined in 2004 as the world of Bistronomie; yes a bistrot but a gastronomic one. Examples: My French colleague-friend, abetted by me, started off with a fish tartare, moved to veal kidneys and ended with a creme brulee while I devoted myself mainly to a civet de lievre with onions. OK. Classic but contemporary; beautifully sourced and cooked and served. I feel truly fortunate to live near places like this that day in and day out demonstrate the melding of tradition and innovation. Our bill (excepting 2 coffees which were offered by the house and 2 digestifs sent over by a fellow Viet Namese restaurateur; Lan Groison of Le MaZenay) with a bottle and glass of wine, was 97.00 E.
L’Arcane in the 18th: How wonderful to have such a place nearby. Our bill, ah, once again, our friends, insisting my blogs and recs were instrumental in their successful stay in Paris, insisted on picking up the check. I protested, but mildly. Thanks. Sens Unique in the 18th: Home food near home. Sens Unique in the 18th near home is a place you don't come to, to be dazzled by but welcomed. Its 2-2-3 lunch menu is super affordable (3 dishes for 20€) but not one you’d cross town for. Colette held off an entree but I had some lovely slices of veal carpaccio in a mustardy sauce. Then she had not greatly sourced cod with shredded zucchini and carrots and I had overcooked strips of chicken on a nice purée. To finish up, she had mixed diced fruit and I the cafe gourmand that came with the same plus a mousse with chocolate sauce and myrtilles with cream. Our bill with a decent bottle of Cotes de Rousillion and another coffee was 64€. Le Bistrot Du Maquis in the 18th: still an undiscovered gem in Montmartre. 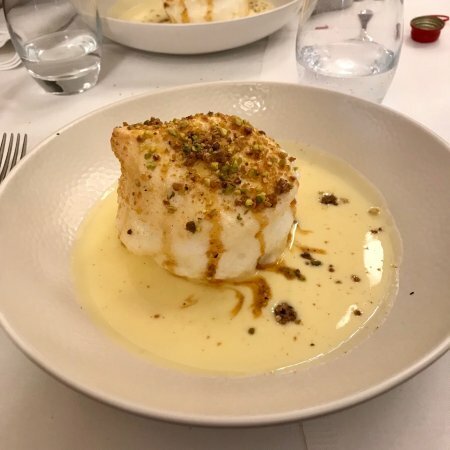 Le Bistrot du Maquis in the 18th remains one of the great culinary mysteries of Paris: how can a place so good, in such a popular location, not have been “discovered” by any but our neighbors? Well, frankly, my dear, I don't give a damn. It's full, it's friendly and it's doing just fine. Colette and I went back today with one of our dearest friends who schlepped in from the burbs to help us eat up a storm on a stormy awful day and it held up its reputation as one of the undiscovered treasures of the hill. I took one look at the carte and ardoise which one can pick and choose from and quickly decided this was to be my abat day, so started off with some veal tongue which was not cold but warm and sausage like. The ladies, however, delayed, and then had healthy portions of scallops with a purée while I kept to the line with a very generous portion of kidneys which were beautifully sourced and cooked. For dessert, I held off and instead poached on their apple tart with ice cream and creme brûlée, which were mighty fine, indeed. Our bill, with wine and coffee, was 153€ for 3 or 102€ a couple. Vava in the 18th: Manif? Teargas? Burning cars? Who knew? I had the best, smoothest, silkiest chocolate mousse ever. Dis-something: I don't want to be Marie Antoinette-ish, just because I live in the unfashionable 18th where no one would think of demonstrating, but despite the genuine grievances of the French lower-middle class, we live in a bit of a bubble in the working part of Montmartre, where life goes on despite our tone-deaf Presidents. So we went out to lunch. Vava in the 18th is in a strange place - on the one hand it's in the Tourist Center of Montmartre and on the other hand it's on a residential street and all Vava's customers are local folk - the visitors come by, look at the carte and pass on to the Italian takeout or Thai place. Silly people, but then, they're looking for something other than we were. All three of us decided to go straight to main courses and skip the entrees, thus we had: beef with some smoked broccoli puree, chicken with girolles and sweetbreads with a terrifically spicy chorizo sauce and a puree. The pureed potato, ordered by our friend and served to me along with the sweetbreads, was (according to Colette) exceptional. For dessert, our friend from down towards the trouble had a salad of fruit, Colette had a tarte tatin and I had the winner of all winners, a silky smooth chocolate mousse, one of the best I've ever had, and I eat a lot of chocolate mousse. Our bill, with a bottle and glass of Marius with the etiquette of the week, a bottle of gassy water and two coffees, was 167.50 E or 111.66 E a couple. L'Arcane in the 18th: Lost in a flurry .... like I was at Spring. L'Arcane, 39 rue Lamarck in the 18th, is a place Colette and I have found to be a reliable provider of surprises: dishes of such complexity yet simpleness, variety of textures, ingredients, colors and flavors, that it challenges comparisons, but invites blissful memories of Point, Giradet and yes, Daniel Rose, who told me he often woke at mid-night thinking of what to put on the table of Spring that noon and dinner. Well, here, we never know what to expect, except that the outstanding service, overseen by Madame, will be on par with the excellent meal and that we will leave happy. So, once again, I'll put up photos of his astonishing dishes with descriptions of parts of their ingredients. We look forward to returning in December. Our bill for three with two bottles of wine, no bottled water but 3 coffees was 266E or 167.32E a couple. Fusain in the 18th: Lafayette we are here. Fusain in the 18th, yes on the tourist golden alley between Pigalle and Caulincourt, where the Rue Lepic boasts some of the best food shopping destinations in the city, there’s been nary a great restaurant since le Miroir went downhill, so to speak. But Fusain has saved the day. Run by two pleasingly thin and very welcoming front folks, one redhaired and one blond, backed up by an excellent kitchen team (one man and one woman). The restaurant, with about 20 seats, was chock a block full with French speaking Yankees in abundance. While the lunch “menu” of butternut soup and canette is a steal at 15€, Colette and I ordered off the carte, spoiler alert, at not much more. I started off with 5 oysters which I dreamt about last night, then moved on to noisettes of biche with a purée of parsnips and Colette had 4 meltinyourmouth scallops with a Jerusalem artichoke purée followed by one hellova millefeuille of hazelnuts, creme and caramel, recommended by our host. Our bill, with a half-bottle of equally well-recommended bio Merlot and a glass of white wine with two coffees (offered), our bill was 67.40€. What a delightful way to begin Colette's stay in Paris. Le Fusain in the 18th: Great food up on Montmartre? Yup. In Tourist Central. 7.5 Le Fusain, 3 rue Durantin in the 18th, 01.70.69.47.48, closed Tuesdays and Wednesday PM's (Metro: Abbesses) is run by a husband-wife front team and a husband-wife kitchen team and in this case teamwork really pays off. I went funnily enough with another husband and wife team who work in the translating dodge, the distaff side having found this places among a raft of possible Saturday lunch joints between our flats. The carte didn’t look all that different but Boy the food sure was! We all went straight to the mains although in retrospect one of us should have tried the salmon, tuna or crispy chicken, which sure looked good as they went by to other tables packed with local folks for whom this was not their first visit. Madame started with a very very fine filet of bar with tapioca and the men had the perfectly undercooked strips of pluma (back of the shoulder) of pork that was crisp on the outside and beautifully moist inside with bowls a creamy ratte potatoes. Then we ordered a pavlova with fine meringue chips and creamy pear and one of those ice cream filled chocolate spheres that collapses under a pour of hotter chocolate. Our bill with no bottled water but three glasses of wine and 2 coffees, was 80.80€ or 53.86€ a couple, the price-quality winner for 2018.